(Bloomberg) -- Handpicked by Benjamin Netanyahu, he's worked side-by-side with him for years and was raised on the nationalist philosophies that underpin his worldview. Now, the protege has become a potential adversary, holding the fate of Israel's prime minister in his hands. This month, Attorney General Avihai Mandelblit is expected to announce whether he intends to indict Netanyahu in a tangle of corruption cases that have raised painful questions about the state of Israeli politics and the future of a deeply divided country. The stakes are high, with the potential to end the political career of a man who has steered Israel for 13 years and is seeking a fifth term in elections on April 9. While all of Israel's prime ministers over the past 20 years have come under investigation, no sitting leader has ever been charged. "We're moving into uncharted territory," said Yuval Shany, vice president for research at the Israel Democracy Institute. "At stake is whether the prime minister is treated like an ordinary citizen." The allegations against Bibi, as the Israeli leader is widely known, paint a sordid picture of a man who abused his power to receive expensive gifts of champagne, cigars and jewelry and was willing to tilt laws and regulations in favor of media figures who could provide sympathetic coverage. All lies, says Netanyahu, who has vowed to remain in office even if indicted. 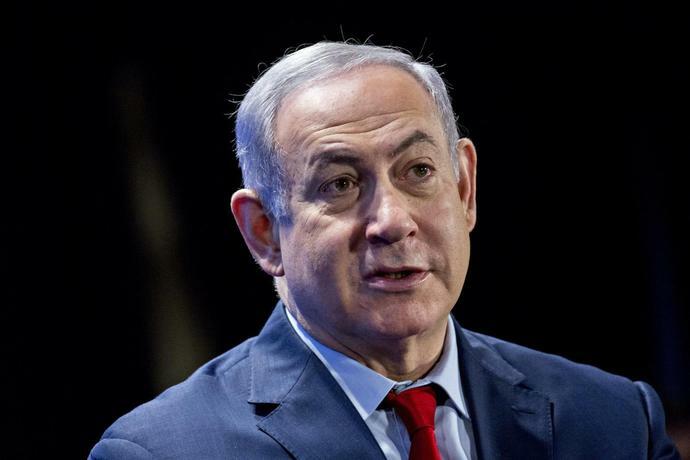 Under statutory law, Netanyahu could stay in power even if convicted and until he has exhausted all avenues of appeal, according to Hebrew University public law professor Yoav Dotan. Whether he could survive the scandal politically is another matter. So far, the corruption allegations haven't cost Netanyahu political support, with polls showing him on track to win elections, form the next government and become Israel's longest-serving prime minister. Voter sentiment could change, however, and current coalition partners could balk at joining his government if Mandelblit decides against him. Jeremy Saltan, an independent political consultant and pollster, doesn't foresee a shift in voter support as Bibi's outbursts against the media and judicial system ring true for many people. "The situation is, the majority of people don't give a damn," he said. Like Robert Mueller, who's probing the wide-ranging allegations against Donald Trump, the soft-spoken Mandelblit has felt the fury of a man who lashes out repeatedly and aggressively against his investigators. Netanyahu has accused the 55-year-old Mandelblit, police and prosecutors before him, of being a tool in a leftist plot to remove him. An Orthodox Jew raised in a secular family loyal to the precursor of Netanyahu's Likud party, Mandelblit spent most of his career in the army's legal department, ultimately becoming its top lawyer. In 2013 he entered government as Netanyahu's cabinet secretary. In 2016, a year after Mandelblit completed his PhD on "Lawfare and the State of Israel," Netanyahu appointed him attorney general. Mandelblit has said he won't shy away from an indictment if necessary. He's already ruled that the prime minister can't take money from wealthy foreign friends to cover his legal expenses and recently rejected an appeal by Netanyahu's legal team to delay an indictment decision until after the election. Among army and government colleagues, Mandelblit has built a reputation for being deliberate, thorough and a straight-shooter. As Netanyahu's cabinet secretary, Mandelblit won the admiration of non-Orthodox women demanding the right to egalitarian prayer at the Western Wall, Judaism's holiest prayer site. "I really had very little hope that I would have a dialogue, certainly not a meaningful dialogue, with this guy, and he shocked us right from the start," said Anat Hoffman, one of the leaders of the women's movement. "He has a backbone and he has a pair of ears, and these are two organs that are under-used in Israel's leadership." The pace of the investigation, however, has riled Netanyahu critics, who accuse Mandelblit of dragging his feet to protect his former patron. Protesters have gathered weekly near the attorney general's home for almost two years demanding Bibi be put on trial. In the supercharged political environment, even the grave of Mandelblit's father was desecrated. While Bibi's predecessors have also been investigated, charges were brought only against his immediate predecessor, Ehud Olmert -- and then, only years after he stepped down to try to clear his name. Olmert eventually served time for bribery. Two decades ago, as attorney general, Elyakim Rubinstein oversaw -- and later closed -- an investigation into Netanyahu's suspected influence-peddling in his first term as premier, citing a lack of evidence. "It's a very heavy responsibility on your shoulders and you definitely don't sleep nights," he said. "Many people say they don't envy him. I don't envy him either." The consequential decision to impeach should not be made lightly. But Mueller&apos;s damning report is an invitation that Congress shouldn&apos;t refuse.